LONG BEACH – Concerns surrounding the Alamitos Marina Rebuild were addressed by the Long Beach City Council on Tuesday, March 4 as councilmember’s stressed their support for the completion of the project in a timely manner. In other words, delays are unacceptable. “I apologize to the boat owners that we are in this situation,” Councilman Gary DeLong said. “I always thought we were moving forward; it was going to happen. It’s been a surprise that we haven’t gotten funding locked down. “Hopefully in the next 30 days we will have a solution to this thorny problem,” he added. Several boat owners who slip their vessels in one of the marina’s seven basins voiced their concerns to the council during the City Council meeting. Many attended to speak specifically about the importance of moving forward with the project as docks continue to deteriorate. “Our message is ‘rebuild the docks now.’ The slip fee increase was made – we did our part now it’s time for you guys to do your part,” said Tom Mayes, president of the Long Beach Marina Boat Owners Association (LBMBOA). Slip renters were hit with fee increases in 2013 when the council approved a 2.5 percent phased in approach. Boaters in the rebuilt Downtown Marina, and in Basins 1 ,4 and 8 in Alamitos Bay Marina pay the new rate and those in Basin 5 will pay the new increase when the docks are completed. 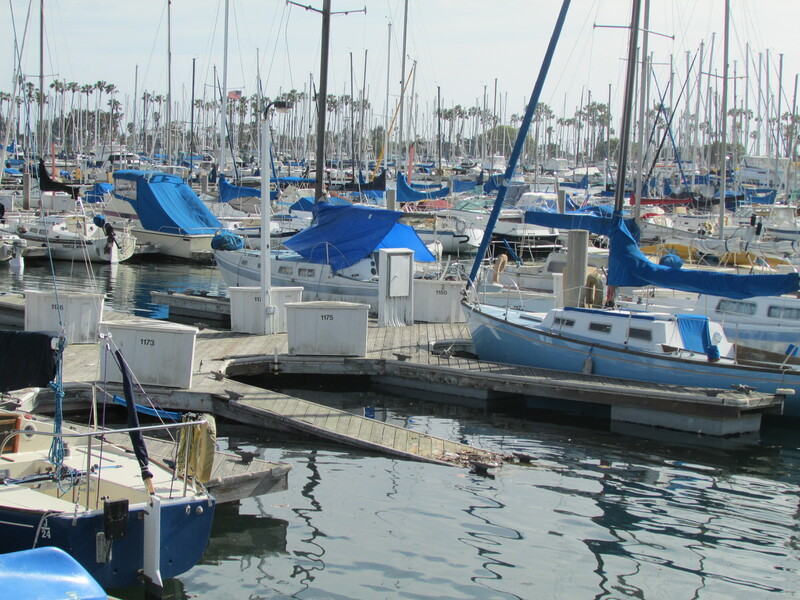 Slip fees in Alamitos Bay Marina were increased 4.4-percent in 2012. Boaters were alerted of the potential delays in completing the estimated $98 million rebuild in an email blast from LBMBOA. Mayes sent the newsletter after he received an email from Councilman DeLong about the delays. According to the email, Councilman DeLong was concerned that Long Beach City Manager Patrick West may be willing to delay the Alamitos Bay Rebuild indefinitely in spite of the additional cost that the city would incur when the rebuild is restarted. The additional cost is estimated to run the city $17 million. Demobilization and remobilization will run the city an estimated $640,000 in additional costs, as stated in a staff report. Another issue is the city’s dredging permit that has an expiration date of Oct. 31, 2015. Dredging costs under the permit are $1.4 million for Basins 2 and 3 and $500,000 for Basins 6 and 7. However, dredging costs can climb if not completed under the permit. The increase in dredging cost is due to having to move the dredged sediment upland instead of placing it in an offshore location. West reassured the council that the project is extremely important to the city but that they are not running into financial issues. Completing utility work and taking care of some of the issues on the docks are also being considered. In February 2010, the city began the rebuild of Alamitos Bay Marina, selecting Bellingham Marine Industries for the design, engineering and construction of the project. The project was divided into phases with Basin 1 in the first phase, Basin 4 in phase two and Basin 5 in phase three. Basin’s 2 and 3 round up the five-phase project. Phase three (Basin 5) is to be completed within the next few weeks. The rebuild is being funded in phases, with the first phase costing $25 million. The California Department of Boating and Waterways (Cal Boating) provided a $18.3 million loan toward the project. Phase two of the project is expected to cost $19.3 million. A Cal Boating loan will pay $12.1 million of the project’s cost. Councilman Patrick O’Donnell asked staff to look into a possible outstanding loan that the city may be able to use for the project. West said his staff would look into it. Until then, boaters will continue to tolerate the dilapidated docks. Speakers at Tuesday night’s meeting explained that Basin 2 and 3 dock conditions are unsafe with boards jutting out and nails popping out of the wood. These potential safety hazards have resulted in tripping, falling and one boater attempted to hammer the nails back into the wood. According to a staff report, the existing docks have become more difficult to maintain and it may only be a matter of time before someone sustains a serious injury due to the poor conditions of the dock. Putting the city at an increase for potential liability. Others at the podium argued that slip renters have done their part to help with the rebuild since they have incurred slip fee increases. The fee hikes were implemented specifically to fund the rebuild, many explained. Some speakers said it was unfair for the city to rebuild marina basins to accommodate larger boats and yacht clubs but leave smaller boats with deteriorating docks. The dais agreed with the speakers and continued to stress to staff and the public their support for keeping the project on track. Councilwoman Gerrie Schipske asked staff to pinpoint what needs to be fixed immediately. City Council voted unanimously on a request for the city manager to prepare a report specifying specific steps in moving forward with the rebuild in the next 30 days. Construction began on Sept. 17, 2011 with the removal of the 1950s-era docks and piles in Basin 4, which is home to the Long Beach Yacht Club slips, and dredging the area to its original design depths. When completed, Alamitos Bay will contain 605 fewer slips, losing many in the 20- to 30-foot range, while gaining slips in the 35- to 50-foot range. Alamitos Bay’s current 1,967-slip total will be reduced to 1,646.